Yesterday was Meet the Media Day for Lin in Houston, and, suffice it to say, there were more reporter-folk there this time than the last time Lin was in Houston. 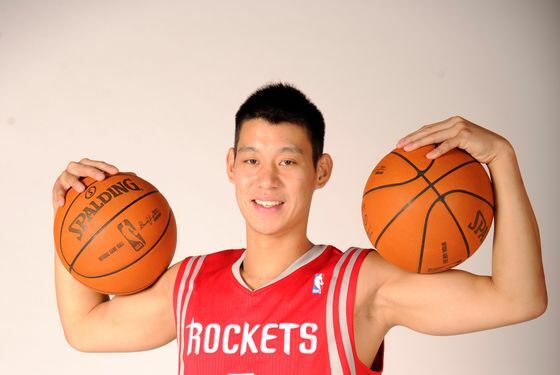 The Rockets are pushing the decision to pay so much for Lin as the correcting of a mistake, the team being foolish letting Lin go early last year — remember, this will be the second consecutive training camp for Lin with Houston — and they're doing backflips to have him back. Because Houston is a more normal place than New York City — at least when it comes to media — most of the questions were about Lin's knee, and God. But our favorite part, another reason to like Lin, is how he addresses all his critics. He doesn't think they're haters; he thinks they're right. I want to get much better with everything with my left hand, whether it’s passing, finishing, driving left, making decisions while going left. There are a lot of things you can see by breaking down my advanced stats that show how I played last season. They’ll show you there’s a lot of different ways I can improve. I’ve spent a lot of time breaking down film from last year. (The critics) are right. I haven’t done it for a long time. I still have a lot to do to become established. I’ll be the first to admit it. I just make sure that I focus on what I need to get better at, what my coaches want me to get better at. "The critics are right." We think the Knicks will be regretting their decision not to match Lin for a long, long time, but even if we're wrong, even if Raymond Felton is incredible for the next four (four!) years, we'll never stop cheering for Lin. We were all correct to love this guy. Godspeed, Jeremy. By the way, while we have you: ESPN's True Hoop blog has a great breakdown of the Knicks' Lin decision — if you can stomach it — and also, Landry Fields was sad to leave, too.